County, city, state and community volunteers will take to the streets of Camden Sunday with donation buckets as part of an ongoing effort to assist those affected by Hurricane Maria in Puerto Rico. 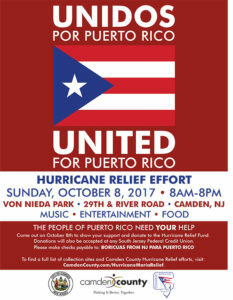 (Camden, NJ) – From 8 a.m. to 8 p.m. on October 8, members of the community will show their support and make donations to the Hurricane Relief Fund, Boricuas from New Jersey para Puerto Rico. Volunteers will report at 9:30 a.m., and corporate partners will present donations at approximately the same time. Throughout the day supporters can also enjoy food, music, and entertainment. Freeholder Carmen Rodriguez talked about the moral imperative to help the millions suffering through the fallout of Hurricane Maria. The fund-raising effort is taking place across Southern New Jersey. Senator Nilsa Cruz-Perez explained the importance of working on this as a combined community. A full list of collection sites and more information about the county’s effort to send aid to the people of Puerto Rico can be found at www.CamdenCounty.com/HurricaneMariaRelief.